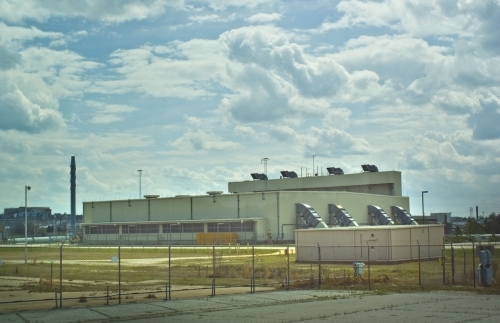 Shown here is S Area, where glassified, high-level nuclear waste produced at the Savannah River Site is temporarily stored. The US Nuclear Waste Policy Act designated Yucca Mountain Repository in Nevada to serve as a repository for our nation's nuclear waste. However, scientists have discovered this repository resides on the Bow Ridge Fault. Furthermore, in early 2009, President Obama issued a statement declaring "states should not be unfairly burdened with waste from other states," and funding for Yucca Mountain has been drastically reduced. The answer to this question leaves our president and our nation with many important considerations. For example, SRS has employed thousands of South Carolinians over the years – Georgians too. Local contractors who have been hired by SRS to help build facilities have benefited as well. That said, South Carolina lost six communities to the cause of US nuclear weaponry. 6,000 of our citizens lost their homes and were displaced. Families were torn apart and neighbors were never seen again. Worst of all are the extreme health risks we have incurred over the past 55 years. There is little on earth that can hurt people more than a nuclear explosion or a radioactive leak. SRS is on the National Priorities List as part of the EPA's Superfund program, which means that it is being investigated for "known releases or threatened releases of hazardous substances, pollutants, or contaminants." These risks will be with us for decades to come. Though SRS officials are working hard to find solutions to these problems, a great deal remains to be done. The question then becomes, is Obama right? Is it fair for South Carolina to continue to bear the burden of Cold War nuclear waste? And if not South Carolina, then who? Does anyone deserve to bear this burden? Beyond this, what opponents fear most is that SRS, in order to stay viable and relevant now that the Cold War is over, will encourage the production of new nuclear facilities – including reprocessing facilities – which will create even more radioactive waste than we already have. Senator Lindsey Graham and Second District Congressman Joe Wilson are pushing hard for these plans, citing France and Japan as role models.4 Nuclear issues specialist Tom Clements says Representative Wilson and others ignore the facts that "every country that sent spent fuel to France for reprocessing has now stopped doing so ... that the UK's reprocessing plant has had huge problems and will likely close ... and that Japan's Rokkasho reprocessing plant is having great trouble starting after two years of trying." Dr. Frank von Hipel, a well-respected Princeton professor, concurs. His May 2008 article in Scientific American, "Nuclear Fuel Recycling: More Trouble Than It's Worth," outlines the concerns associated with reprocessing, including the excessive expense and an increased possibility of terrorist attacks. "[Reprocessing] has various drawbacks ... One is that extraction and processing cost much more than the new fuel is worth. Another is that recycling the plutonium reduces the waste problem only minimally. Most important, the separated plutonium can readily serve to make nuclear bombs if it gets into the wrong hands." Still, Wilson says he favors using SRS for such "clean" technologies as coal, oil, and nuclear, rather than "unproven" technologies like wind or solar. 5 He adds offshore drilling to his list – though obviously not at SRS – just as long as none of the drills are visible from the tallest building in Charleston. "I am very concerned with the hospitality industry in South Carolina," he states. It is important for South Carolinians to evaluate the risks and benefits of nuclear reprocessing at SRS and to become involved in this debate. It may bring jobs – which are extremely valuable in this economy – but will it bring them at too high a cost?